The time has come. Ash Street Project's outrageously animated resident artist, Matt Causey, is preparing to exit and take on the world. It simply will not be the same without him. As many know, Matt came to us as one of our first visiting artists. Yet, as it often goes, things shifted for Matt during his time in Portland. The decision for him to stay on as a long-term Resident was logical. When Matt initially came to Portland, he was known for his cleverly illustrated black and white pots and wall boxes. These gems exude Matt's hilarious and outspoken personality and his copious illustrational talents. His "Famous Potter Series", as profiled by Garth Clark (click here), are fantastic caricatures of Pete Voulkos, Beatrice Wood, George Ohr and the like. 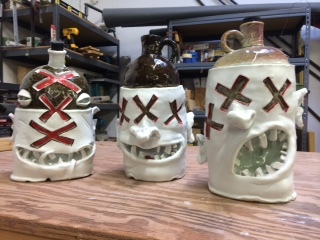 Similarly, Matt had been making face jugs that riffed on the influences of both his southern upbringing and his love of folk art. His version of the face jug, had an animated sensibility so uniquely his own. But over time, Matt became interested in how he could adopt methods to reproduce work without painstakingly hand-painting each piece. He felt he had lived that experience, had the base knowledge, and now wanted to work towards production that he might, at some point, simply oversee. Over the course of his time at Ash Street, Matt experimented with everything from slip casting and decals to clay bodies and firing temperatures. Factoring heavily into the experimentation and discussions were honing the options for selling work, from brick and mortar venues to craft shows to on-line sales. At a small business workshop he attended at ADX, he connected with CrowdSupply, a local crowd sourcing business, and together they visioned his new product line. 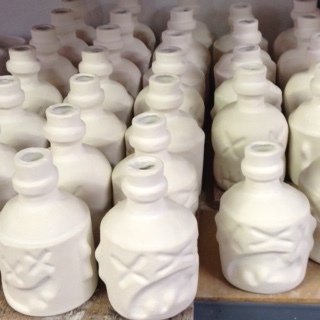 His clever new "emojugs" are having their debut "sneak leak" this week at several fun local locations (see Facebook post). This will also be a chance to wish Matt well, as he heads off next week to North Carolina and France in search of more permanent digs. You can follow Matt's adventures by following him on Facebook or Instagram, where Emojugs have their own page!